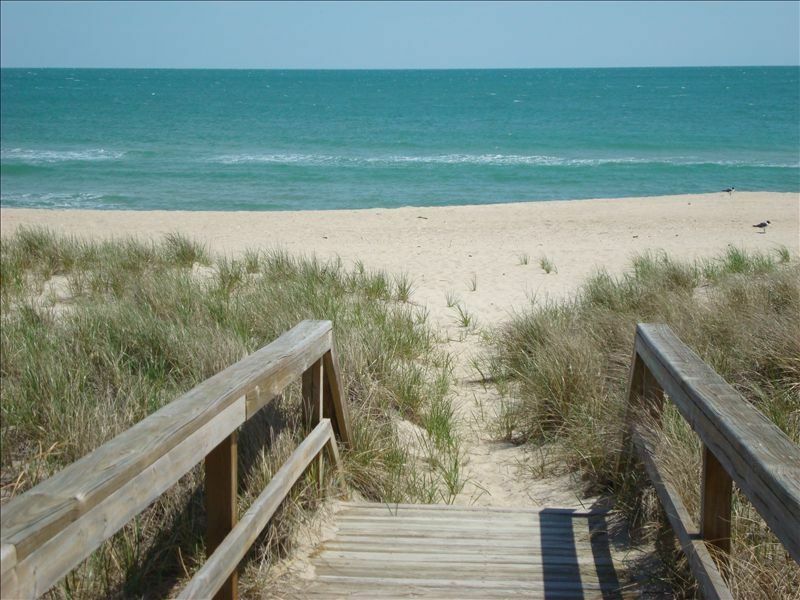 If you like beaches the way they are meant to be; quiet, serene and beautiful, then come visit our Seaside Escape in Kure Beach, NC!!! If you want a place to stay that is clean and comfortable as well as convenient... THIS is the place for you! Our three bedroom, two bath townhouse is a two-story unit overlooking the Atlantic oceanfront. This is not a high rise, just three steps in the back door and three steps out the front door to the beach. From the master bedroom you can wake up with the sunrise and gaze out through french doors at the sand and waves crashing in on the shore (right from your bed). The view is amazing! There is an additional upstairs bedroom that has a double bed and two twins (the kids will love this colorful room). Finally there is a third bedroom with a queen size bed and second bath downstairs (great for elderly guests needing a first floor unit). You can enjoy ocean front views from the porch swing and rockers on the upstairs deck or from the first floor covered porch (loaded with benches and rockers) - either place the ocean breeze makes the climate just perfect. You may be on vacation, but you'll feel like you're at home. We offer a fully-equipped kitchen with all the major/minor appliances (ie. cable TV, VCR/DVD, microwave, coffee pot, toaster, blender and dishwasher). You'll be able to relax or entertain, whatever you like! When you come inside from the beach feel like you never left. A classic nautical theme can be found throughout the house. From the murals on the walls, to the waves and shells, you'll find the decor is nothing less than soothing and inviting. As for local activities, you can find much to do. Choose from the newly expanded and renovated Aquarium at Historic Fort Fisher to the Cape Fear Museum in downtown Wilmington or something as simple as taking a short 4 block stroll to see what they're catching on the Kure Beach pier. Pleasure Island puts on many local events, activities and festivals. There is always something going on here! If you tire of fishing or swimming, you are conveniently located right between the two Historic towns of Wilmington and Southport. Wilmington is just 16 miles north. There you can visit the U.S.S. North Carolina Battleship (maybe even catch an old flick on the deck one evening) or take a stroll down the beautiful waterfront streets for an endless choice of shopping and dining. There are also a lot of fun indoor activities in nearby Wilmington: Bounce House, Defy Gravity, Jungle Rapids, Mayfair Cinemas and Wilmington Children's Museum for example. Either way you are covered on those 'rainy days' with indoor activities in this area! Less than six miles south you can hop on a short ferry ride to the quaint town of Southport or Bald Head Island. You will probably recognize this town from such films as 'I Know What You Did Last Summer,' 'Matlock', 'Domestic Disturbance', or the more recent 'Safe Haven'. If you're a movie buff take a tour of the local Screen Gem Studios and see where many movies have been made such as 'Iron Man III' as well as where 'Dawson's Creek' and 'Sleepy Hollow' was taped. Worried about what to do with the kids? Take them to Jungle Rapids to enjoy the water park, go-carts, and miniature golf. You will not want to miss the zoo either. A zoo at the beach you ask? You've got it... or actually we do! Tregembo's Animal Park (previously known as'Tote-em-in Zoo') has many animals ranging from the ones you'd like to pet to the ones that you know to stay away from. Lions and Tigers and Bears, oh my! If you really like amusement parks; take a day trip to busy Myrtle Beach and go to the Pavilion (little more than an hour away). While you're there check out 'Pirate's Voyage,' 'Ripley's Believe It or Not,' and Broadway at the Beach, or just stroll the boardwalk... then come home to your quiet beachfront town. For those golfers in your group; you will find several local courses (some even championship) to challenge your golfing skills. Don't forget all the shopping, dining, and sightseeing! With the warmer temperatures in prime season complemented by the mild temperatures in the off season; as well as the area attractions and friendly local residents... you'll find our townhouse a great vacation spot year round! Come and stay with us at our Seaside Escape! We are local owners! We bought this property in 2001 while we were looking for a place to vacation for ourselves. We fell in love with the location and the appeal of owning a home on the beach. Since then we have also moved to Kure Beach and are raising our children here (2 girls and a boy). We love Pleasure Island and the small town community feeling it offers. We are also Mortgage Brokers and can help you fulfill your dream of owning your own Seaside Escape! Here on the island we love all the activities offered at the Carolina Beach Boardwalk in the summer: charter fishing tours, party boat tours, family movies by the lake, paddle boating, the amusement park (summer only), surf lessons, beach bingo, fireworks and world famous doughnuts. We enjoy visiting the NC Aquarium along with Historic Fort Fisher, driving out to the north end of Carolina Beach (Freeman Park) to camp for the day on the beach. We like riding our bikes onto the ferry and over to the little town of Southport. We can't believe we actually live here and get to enjoy this all year! We are thrilled to be able to share our 2nd home on the beach with you and hope that you will enjoy it as much as we do! Best of all, if you need anything we are minutes away. I grew up vacationing in Myrtle Beach, SC and my husband at Nags Head, NC. We found Kure Beach to be a wonderful alternative! It is located on an island about 11 miles long and consists of three small towns Carolina Beach, Kure Beach and Historic Fort Fisher. It is not the commercialized or tourist attracting town of Myrtle Beach. (We love to visit there but usually make it a day trip) Kure Beach consists mostly of cottages which are 2nd homes or primary residences. There are lots of wonderful restaurants, shopping and local activities offered year round. This property has private parking, spectacular views, and nice size rooms. One of it's best features is that it's ground level (4 steps up and you're in the door). There is always some kind of small town festival, farmers market, concert, fishing tournament or local race happening on the island - but it is never too crowded. One of the secret advantages of this island is a back road (Dow Rd) which runs along the government owned property lines that allows you to drive from practically one end of the island to the other at 55mph. If you know about this little local secret, traffic is never a problem. Check out the Pleasure Island Chamber of Commerce's website for local events and happenings. They don't call it 'Pleasure Island' for nothing! toilet, combination tub/shower, tub, One complimentary roll of toilet paper will be provided. toilet, shower, One complimentary roll of toilet paper will be provided. Linens and towels are NOT provided unless you request the linen and towel package to rent for an additional $100. Beach towels are not provided. Small size stackable washer & dryer available in unit. Please do not overload. Private off street parking. This building has five units and 8 parking spaces. There is one space labeled for each of the five units and three labeled for guests (to be shared by the five units). There is a working ice maker in the freezer section. I've been told by many renters that we are well stocked. There is NOT an outdoor grill for this unit. You CAN bring your own but you are NOT allowed to grill on the decks or within 10' of the building. Great family vacation spot! Right on the beach, perfect location! A great house! Thanks for sharing it with us. We had one of the best vacations! Kure beach is beautiful and exactly what we wanted! The townhouse has one of the best locations, close to the beach and within walking distances to the pier and several restaurants. It was also decorated very beachy and we loved everything about it, the porches were awesome!! I would love to stay here again. Thanks Robyn for letting us rent your beautiful townhome. Family of six - really enjoyed everything about this property. You are right on the beach, with just five other units on the property. Location is great, more residential feel than the large towering condo complexes found around other areas. You can walk five minutes to the Kure Beach restaurant and fishing pier. Or, you are 5 minute drive from the aquarium and 10 minute drive to Carolina Beach for more activities and restaurants. Place was really clean, decor was up to date, and beds were comfortable. A few minor items that need fixed, but nothing that detracted from the property. Owner is really responsive and good to work with. Before leaving, my family was already talking about coming back next year. A definite great place and location. Nice place . Owners are available for any issues. Wonderful plan on going back. Great views up and down the strand! Clean and comfortable! Walking distance to nearby restaurants! So glad you enjoyed your stay! Please come again! Thanks for letting me know about the blender. I'll take care of that. NO PETS ALLOWED AT ANY TIME. If your dates require a 7 night booking then there are no exceptions. :-) HOLIDAYS REQUIRE 7 NIGHT BOOKINGS. Shorter booking will not be accepted prior to 2 weeks out from holiday. TAXES, REFUNDABLE SECURITY DEPOSIT AND CLEANING FEE ARE ADDITIONAL AND REQUIRED. Packages of bed linens and a 3 piece towel set for 8, are available to rent at an additional charge of $100 - if you don't want to bring your own. There are pillows, mattress covers, quilts, extra blankets and dish towels provided. There will be starter supplies of toilet paper, trash bags, hand soap and paper towels upon arrival. You will need to bring your own supplies or plan to purchase here at a local store any extras that you will need.